I received notice in the last couple of days from Golf Industry Magazine in regards to being recognized in their yearly social media awards. 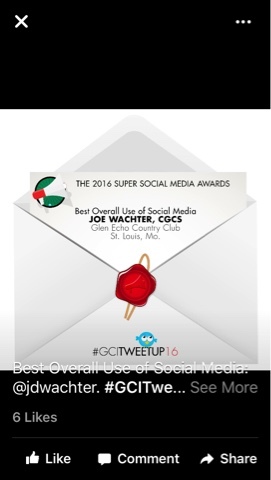 Being recognized for 'Best Overall Use of Social Media' along with Rick Tegtmeier CGCS from Des Moines CC. I've know Rick a long time. Quality superintendent and person. A nice award to receive. As you know, I think my most important role is to communicate what is happening on the property that you and your family support with your time and treasure. I appreciate your encouragement and support over the years regarding our efforts. No time to rest. Time to improve upon what we've done in the past! With our current conditions improving and the trend for more wind and warmth over the next couple of days, the course will be open for play. Conditions will continue to improve on some of our slower to thaw greens and we should be in good condition for Saturday which is the day most folks are planning a game. I believe we will probably be carts on paths but should be able to allow red flags. We will continue to evaluate this situation as well each day. Thanks for your patience. I'm sure no takers today but the course is closed due to greens beginning to thaw. Checked the depth this morning and greens are thawed about an inch down. This is too shallow to allow play due to the potential for root shearing which could lead to significant energy used repairing this damage in the spring. We will continue to check daily about this weekend. Cold temperatures tonight could refreeze our greens. You will need to check with pro shop daily before coming to the club if you are wanting to play. We appreciate your cooperation in this matter. The driving ranges are open on the mats if you are interested in hitting some golf balls. Not to burst your bubble but I'm flying the trial balloon early. Just a reminder to not get too excited with the upcoming weather forecast. My best guess is we will be in the middle of frozen greens beginning to thaw and will have to remain closed. We will be evaluating the progress daily to keep the pro shop and you informed. The thaw must go deep into the profile to allow the water that will be trapped near the surface area to evacuate. Without this water being able to drain through the profile, the green's surfaces will be like a soaked sponge and will imprint severly. Also, if greens have not thawed deep enough, the probability for roots to be sheared from foot steps becomes quite high. I would think we will be able to get the range tees open the next couple of days. 6 Tee, not shown 5 green which is covered as well. Three large trees were identified for removal this fall due being severely compromised(dangerous) and or near death. Time for their removal. Two of these trees were a Sweetgum and Pin Oak along the roadway at 10 tee and a third tree Oak on the left side of 4 near the 5th tee area. These trees first had to be topped by our contractor due to their size and then we removed the totem pole and hauled out the material. This work took nearly a week to accomplish. Some of the material was chipped and will be used on property, the oak that we can handle will be split and used for shop heating and sold to members for firewood. Stumps will be ground in late winter when our contractor comes in and completes them in a couple of hours. The oak on 4 was nealy 7 feet across from flare to flare. Oak on 4 near 5 tee. Large crack in upper left limb. Been watching tree for last couple of years. It was time to remove. Gamma Tree Service removing all the upper limbs making it easier for our staff to drop the stub to the ground for removal. Three guys notching and now near the end cut ready to drop to the ground. Safe and sound and on the ground. Sweetgum along the Pearson Lane with large wound on trunk and crown was compromised as well. Very hazardous and time to come down. Sweetgum is down, now working on large Oak near 10 tee. Beautiful tree but lightning strike with huge wound in main trunk and over 1/2 the tree last season had no leaves. Time to go to rest. Gamma finishing off the top. Forget to put the links for the tree videos on the last blog post. Here they are for those whose videos do not open automatically from the device you might be using. 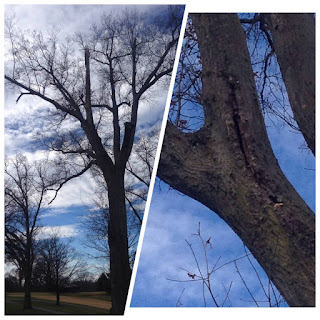 A nice balanced video from the USGA regarding trees on the golf course. Also a second video which I've posted before on the blog. It discusses the need for light and air movement on our main play surfaces(greens) and the negative impacts that can be placed on this most important surface from trees planted in the wrong location. Beginning next week we have contracted removal of a few trees that are hazardous and too large for us to drop without first having the limbs trimmed off. This will then allow our staff to remove the totem poled main trunk safely. We drop the logs and haul them to our maintenance area for splitting or placed in our dump for grinding in the future. This work will begin on Monday and Tuesday(for the contractor) and will probably take most of next week for our staff to get the logs removed, area raked and material hauled away. The staff have been involved in splitting and stacking tree parts that were removed during the season to make room for the trees that have been approved for removal by the Green Committee and Board. December weather statistics are remarkable as are some of our yearly totals. The picture above is the flooding of Crystal Springs Quarry. Creve Coeur Lake is to the very far right. 7TH WARMEST YEAR OF 58.7. TIED WITH 2011, 1998, and 1938. All-Time Rainfall for a year. Official number was near 62" but not posted on NOAA website. 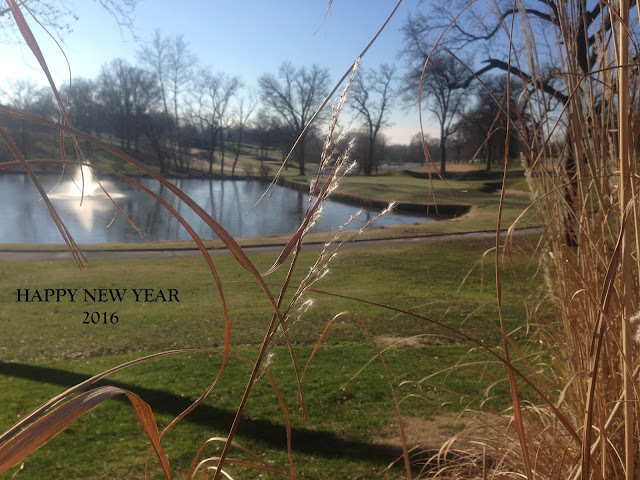 A beautiful crisp and cold beginning to the new year at the old girl Glen Echo. As a group we have faced many challenges during this last year, Some have lost someone we are close to. Illness takes its turn throughout our ranks. Births have brought children, grandchildren, nieces, nephews, godchildren and others into our lives. Many a round and cocktails have been shared the last year. A few hole in ones, a couple stories both true and slightly embellished have made their way around the ranks, Golf trips, hunting trips or just sightseeing to great parts of our world have given us great memories. I know we cannot necessarily stop the heartbreaks in our lives but hopefully you have the opportunity to experience some of the fun in life during moments this year. Watch a child smile or say their first words, see a beautiful sunrise or sunset, maybe get that always escaped hole in one, eat a great meal or share a beverage with someone we appreciate or love. As always, we appreciate your support and hope we can continue to meet and exceed your expectations on the grounds of Glen Echo CC!